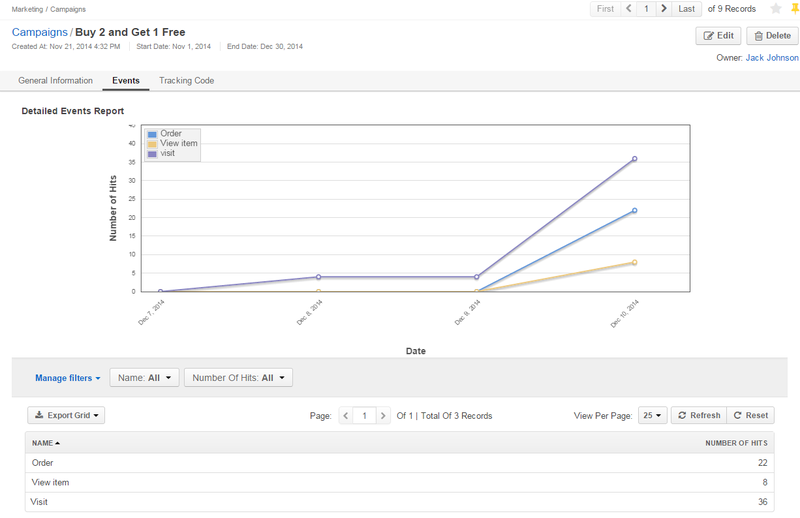 Campaign records in OroCRM are used to define general details of the marketing activity and monitor its flow and results. You can include any amount of Email Campaigns and Tracking Website records into one Campaign and get the full picture to evaluate the campaign efficiency. This article describes the ways to create, manage and view the Campaign records. 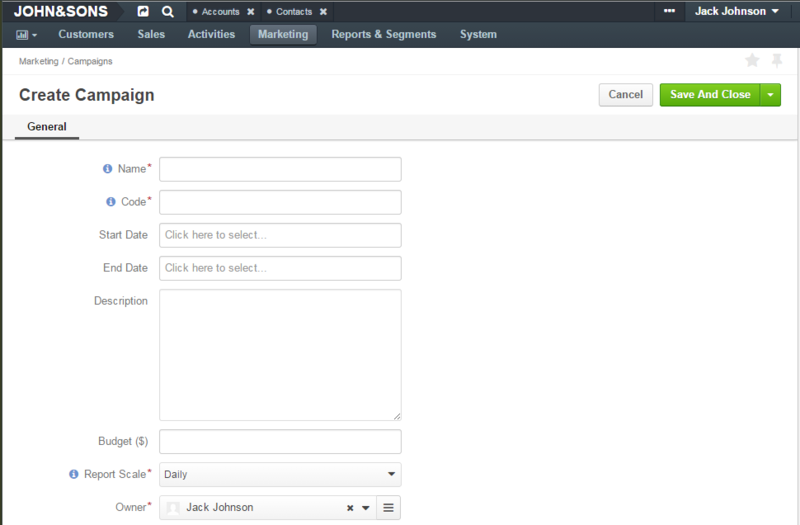 Go to Marketing → Campaigns page and click Create Campaign button in the top right corner to get to the Create Campaign form. Code* Unique code of the campaign, used to generate its tracking settings. May contain only alphanumeric symbols, dashes, and underscores. Owner* Limits the list of users that can manage the campaign to users, whose roles allow managing campaigns of the owner (e.g. the owner, members of the same business unit, system administrator, etc.). Optional fields can be used to define such details as start and end dates of the campaign, its description and its budget. 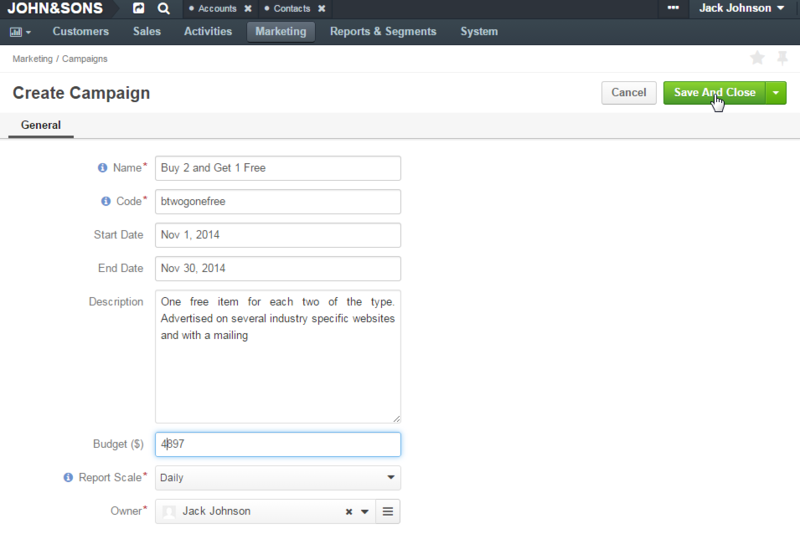 Custom fields may be added, subject to specific business-needs. The default Sender Email and Name values are defined for all the emails generated in the system within different marketing campaigns by the corresponding configuration settings (System>Configuration>System Configuration>Email Configuration). Events: each event represents one time a user has accessed a pre-defined part of the Website following the campaign. The section contains the “Detailed Events Report” and the grid. In the example above users have accessed the site 36 times, twenty-two out of these times, they’ve made an order and 8 times they’ve viewed some item details. Campaign tracking code. A piece of code, that you can use, to include details of Tracking Website records to the Campaign.